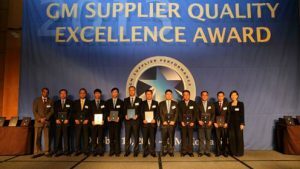 AVX Corporation, a leading manufacturer and supplier of passive components and interconnect solutions, received a 2015 Supplier Quality Excellence Award from General Motors. Presented to AVX’s Tianjin, China facility, which manufactures the AEC-Q200-qualified TransGuard Automotive Series multilayer varistors that the company supplies to GM, the award recognizes AVX for sustaining the highest levels of performance in each of 13 different categories, including zero defects in shipped products and 100% on-time delivery during calendar-year 2015. AVX’s TransGuard Automotive Series multilayer varistors (MLVs) combine circuit protection and EMI/RFI attenuation in a single, high-reliability device to both reduce component count and save critical board space in a variety of harsh automotive applications, including: inductive switching, DC motors, water and fuel pumps, and relays. “Our TransGuard Automotive Series varistors are designed to combine the highest levels of quality and performance for automotive customers, so we’re grateful to have been publicly recognized by GM for meeting and exceeding their strict quality and performance criteria, and commend our Tianjin team for their commitment to successfully satisfying so many rigorous customer and automotive industry requirements,” said Pete Venuto, vice president of sales, AVX. For more information about the wide range of AEC-Q200-qualified components AVX manufactures for modern automotive applications — including AVX’s TransGuard Automotive Series varistors, ESD-resistant MLCCs, NTC thermistors, and stacked multilayer varistor/MLCC devices — please visit AVX’s Automotive Industry Applications page at http://www.avx.com/industry-applications/automotive/. For all other inquiries, please visit www.avx.com, call 864-967-2150, or write to One AVX Boulevard, Fountain Inn, S.C. 29644.